This review and more at Sab The Book EaterThis has got to be one of the best books I've ever read. Thirteen Reasons Why tells a compelling story about Hannah, and girl who committed suicide, and thirteen reasons that pushed her to the edge. When I read the synopsis I literally got goosebumps. The cover alone gives me chills. I wanted to read it but at the same time I was worried it might be too disturbing. I was wrong. I enjoyed every page, I read with such speed because I couldn't get enough. I had to know why Hannah killed herself. And I had to know Clay's role in it.I don't even know how to begin this review because there are no words to describe how amazing this book is ("no words" and yet here I am reviewing it).It's my first time to read a book written this way. It was interesting to read Hannah's story told through the tapes Clay listens to. It painted a clear picture of Hannah without her actually being present in the book. Everything happened in one day on Clay's end but on Hannah's, it involved a series of events that took place in a long span of time. Reading the past (the tapes) intertwined with the present (Clay's thoughts and narration) created a beautiful effect that really brought the story to life. It made me feel how painful it was for Clay to listen to those tapes and feeling so useless because he wasn't able to do anything to stop Hannah from killing herself. Clay talking to Hannah's recorded voice was one of the most painful things for me. I cried with Clay and I felt Hannah's pain.There's no other way for me to review this book without giving anything off because to discuss the events that took place in the book or the characters involved would equate to spoiling it. So I'll just say this: this is a must read. This book showed how our actions, even the seemingly meaningless ones, can make or break someone else without us even knowing it. More importantly, it could help shed light on one of the most pressing issues around the globe - suicide. The book's a work fiction but at the end of it all, it left me thinking this could happen in real life. Jay Asher's storytelling really pulled me in. 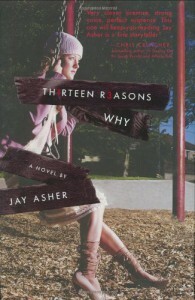 Thirteen Reasons Why is a highly compelling story that you shouldn't miss out on.